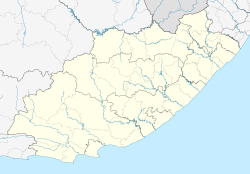 Jansenville is a town in Sarah Baartman District Municipality in the Eastern Cape province of South Africa. Town on the Sundays River, 87 km south of Graaff-Reinet. Laid out on the farm Vergenoegd in 1854, it was proclaimed in 1855 and became a municipality in 1881. Said to have been named after General Jan Willem Janssens (1762-1838), the last Batavian Governor of the Cape. In the late 1700s, outposts of the Cape Colony, in the form of the trek boer and hunters had reached and crossed the Sundays River. The greater portion of what now constitutes the Janesville district fell under Uitenhage. The first European to settle here was Christiaan Ernst Schutte, who obtained title to land surveyed by James Swan in June 1818 described as "Late Loan Place Vergenoegd" of 3000 morgen, and granted to C.E. Schutte in 1820. Schutte was required to pay to "The Receiver General of Land Revenue" an annual quitrent of 50 Rix dollars. Schutte later sold to Prinsloo and moved northwards, to be followed by the latter when fierce, impetuous Petrus Fourie, arrived from Swellendam in 1838, to become the new owner of Vergenoegd. His veins flowing with Huguenot industry, Fourie found the land good. The muddy waters of the Sundays spread fertile, alluvial soil along its banks. Fourie and his sons began to cultivate, and before long one hundred morgen were under crops. The Great North tract passed over Vergenoegd. It was used by hundreds of ox wagons en route to Port Elizabeth, and returning with merchandise. The transport riders found good pasture and ample provisions in wheat, mealies and meat; the district was becoming populous. In 1881 Jansenville became a municipality, and the large surrounding electoral division was named after it (returning two members to the Cape Parliament). The little town of Jansenville owes its origins to the Dutch Reformed Church which formed a parish there in 1854 named after the last Dutch Governor of the Cape. Jansenville is north of the Zuurberg Mountains in an area known as the Noorsveld, after a cactus-like succulent that is common in the district. Between Jansenville and the Zuurberg to the south is a plain that marks the northern boundary of the Addo National Park, while to the north are some hills which have a scenic drive and, at the summit, shortly before the descent through the Ratelskloof Pass, there are views across the Camdeboo plains to the peaks of the Sneeuberg. Jansenville is game country and there are game farms and hunting concessions in the area as well as nature reserves including the Addo Elephant National Park. The town's notable buildings include the large Dutch Reformed Church, a building in the basilican style made of local stone which is a heritage site. The Anglo-Boer War fort north of the town attests to the guerrilla activity in the area in that conflict. The restored Sid Fourie House serves as a museum. 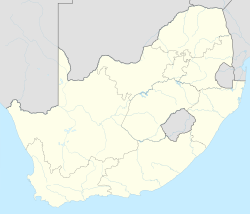 ^ a b "Dictionary of Southern African Place Names (Public Domain)". Human Science Research Council. p. 229. ^ a b c d Sum of the Main Places Jansenville and KwaZamukucinga from Census 2011. ^ J.L McCracken: The Cape Parliament, 1854-1910. Clarendon Press, Oxford. 1967. Wikimedia Commons has media related to Jansenville. This page was last edited on 22 March 2019, at 23:50 (UTC).